Former Totem Netminder in the Frozen 4! 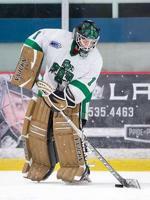 Former Totems goalie Shane Madolora will play in the Frozen Four For RIT! Shane played a season for the Totes as their starting goalie before moving up to the NAHL and then the USHL Winning the Clark Cup with the Omaha Lancers! The 2010-2011 Pacific Division Champion Seattle Totems are pleased to announce that defenseman Kyle Blondin will be playing in the North American Hockey League with the Alexandria Blizzard. The Blizzard (Alexandria, Minnesota) were the 2010-2011 USA Hockey Tier II - Central Division Champions. Blondin, Coach Murphy’s 2010 off season acquisition ended the 2010 campaign as a NORPAC 1st Team All-star on defense and received attention (like many Totem players) at the National Junior Tournament. “I’m very proud of my time with the Seattle Totems. My dad grew up watching the old pro Totems in Seattle – so playing for the Totems was a big deal. I’ve been lucky enough to meet pros like Tommy McPhee and Howie Hughes and Jr. Totems who have worn the jersey proudly – I have feel honored to have worn the Green and White. The expectation and the realization of going to the National Tournament provided us the opportunity to show the hockey world what we are made of and many of us benefited in terms of college hockey and junior hockey opportunities. I want to thank the coaching staff for continually pushing us to excel both on and off the ice; my teammates for all the hard work they put in, Pascale for driving us on our road trips in the bus, the Murphy clan for all that you do, the game night volunteers, and all the fans – I share this accomplishment with you. I am going to miss the guys – and raising the banner at Olympic View – make sure and get it on the web so I can at least watch! TOTEMS ALUMNI’S HARD WORK PAYS OFF! 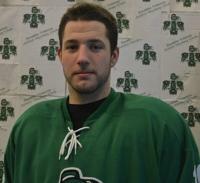 4 year long leader of the Totems, Kyle Farrell’s future is moving forward outside the game of hockey. After finishing is Junior hockey career with the Totems, Kyle has been attending Central Washington University to receive his Bachelors Degree in Law and Justice. Kyle will be graduating this summer, but not only will he be graduating, he has been given a conditional offer of employment by the highly respected Washington State Patrol. Pending is last two department tests, he will be going to the State Patrol academy at the end of July. This is a tremendous honor for not only Kyle but the Totem family. Kyle worked very hard as a Totem and had multiple years of leading the team in scoring. He was a captain for 3 years with the team; he led by example on the ice and with leadership in the locker room. We have no doubt that Kyle will become a great police officer and help protect our communities. Coach Murphy and the Totems staff are very proud of Kyle! When the Utah State University hockey team take to the ice this season they will be joined by former Totem Ian Beckstrom. Beckstrom, a 6’1 200lb forward committed over the summer to play for Coach John Eccles and the USU Aggies. The call during the summer from Coach Eccles showed that the hard work paid off. Throughout the past decade Utah State Hockey has seen its success and popularity skyrocket. Utah State now competes in the ACHA DII West Division and has made several trips to regionals and nationals during the past ten years. During the 2011-2012 season, the Aggies under Coach Eccles finished with yet another trip to Nationals, playing well against top D-II teams in the country. Drawing crowds near 2000 for all home games, the Aggie players have earned high respect in the town of Logan. Beckstrom’s size and speed will prove beneficial to the Aggies, he’s strength will able him to dig pucks out of the corner and has the skills and speed to move the puck up the ice. When asked about his time with the Totem’s, Beckstrom had this to say “I really appreciate the loyalty showed by the both the owner and the Totems coaching staff. They gave me the opportunity to come back and play after time away from the game and without that chance I would not be where I am today. I can’t imagine any other junior hockey program that help individual players move on after their junior careers more than the Totems, and for that I will be forever grateful. T4L! The Totems staff is very proud of "Becksy" and wish him all the best at Utah State! Blondin selected in the NAHL Draft! 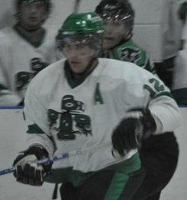 Congrats to Totems f/d Kyle Blondin who was selected by the Springfield Jr Blues Thursday in the NAHL Draft! The Totems staff wishes Kyle the best of luck with the Blues this season! Hoffman to Johnson and Wales ! comprising a total of 182 points with 98 goals and 84 assists in just 97 games. forward has to contribute to their tradition of excellence! Kinkopf to MIAC Hameline University! Totems alumni Patrick Kinkopf committs to MIAC Hamline University. 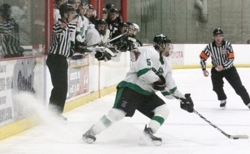 The defenseman spent the better part of the 2010-11 season with the Totems and put up 20 points in 21 games before being traded to the Wenatchee Wild of the NAHL. After Bein...g traded to the Alaska Avalanche over the summer Patrick racked up 6 goals and 7 assists with a plus 8 rating and two shootout wins. When asked about his experience as a Totem Patrick went on to say, " Being a part of the Totems is being part of a family. It is a top notch program and the coaches really care about the players. I want to thank both Coach Murphy and Coach Wilson and the entire organization for everything that they have done for me. I don't know if I would be going on to play college hockey without their guidance throughout my career. T4L!" Fink to play at The University of Wisconsin - Superior !